I just wanted to give a huge thank you to everyone who bought ornaments. My goal was to offer way more this year than I've ever been able to, and I'm so happy to be steadily making ornaments for your trees! There are ornaments still available (though the elephants are sold out), so if you wanted one you haven't missed out (yay)! Those boots are FANTASTIC! Ahh leave it to JC..... amazing! Oh, how cute!!! The sweater is amazing!!!! <3 You have such a great style... Speechless... This red colour suits you perfectly... Wow! 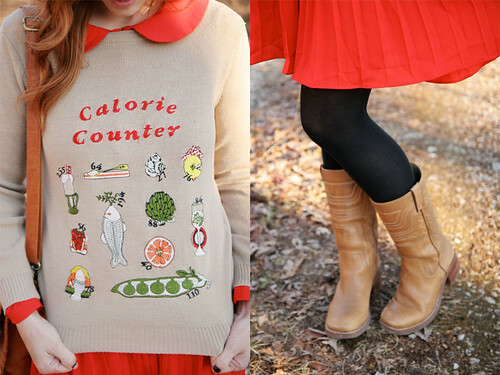 I should get a sweater like this but with the words "Calorie inhaler" cause that's all I been doing since Thanksgiving. The sweater suits you I will say because it doesn't look like your a heavy muncher! Wow you make Christmas ornaments , cool! Which Ornament on Christmas Tree are you? Are you an angel or a star on the Christmas tree? haha, this is so great!! i love the little red collar peeking out. That sweater is great, lol. Such a cute outfit. so cute! 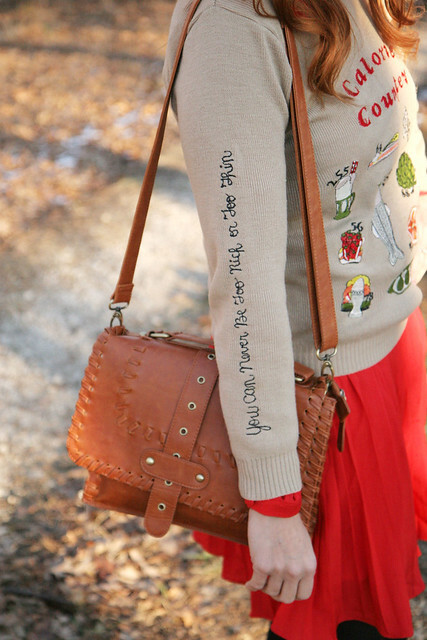 i love everything about this outfit, especially the vintage sweater! That outfit is perfect! haha! I love it! This jumper is too good! I want to make my own with pictures of cakes & sweets. That is an awesome sweater! It's adorable! That sweater is insanely adorable. SO jealous! that sweater is hilarious.. and adorable! eeep! what a treasure that sweater is! Oh my goodness! That sweater is hilarious. Love the sleeve detail, too. What a find. It reminds me of a funny used tshirt I found that said "just get over it" in huge letters. I would wear it when I got cranky and it always lifted my spirits with its ridiculousness. That sweater is awesome (and you pull it off so well)! love the sweater. it's just adorable and goes nicely with that pretty red dress. i love the writing on the sleeve!! Love the red dress. It's the perfect pop of color. haha i find it funny that everything is embroidered on it. such a funny sweater. also, those boots...!!! !...those boots. they are perfect. i am in LOVE with them!! Oh my goodness! That sweater is fantastic! So cute! oh my, I'm in love. 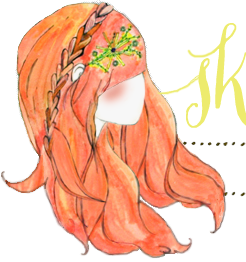 I'm in love with your blog. That sweatshirt is hilarious! i love your bag and of course your hair always looks fabulous! you are PRECIOUS. cutest. gal. ever. katie you look very cute in your ironic sweater. I love that sweater! This outfit is super cute, lady! Love the orange skirt...I don't think I own anything orange! I need to change that...now. You and your looks are so cute. That sweater is A-mazing. Adorable. I really, really like those boots ! You know where I can still find them ? Thanks !